When your computer stops working, it’s easy to start panicking. Nowadays, our computers hold more of our lives than ever before. We store important financial documents, family photos, videos, music, and more on our desktop and laptop computers. When your computer breaks, or an accident happens–you delete a file you need, or accidentally start a system restore—all that data can seemingly go up in smoke. However, your data isn’t out of reach to a trained data recovery expert. In our world-class data recovery lab, Gillware Data Recovery provides a secure, affordable, and world-class computer data recovery service. Recovering Computer Data: Where Does Your Data Live? All of the data on your computer lives on its internal hard drive or solid state drive (SSD). Most computers have a traditional hard drive with spinning disks; newer models of laptops contain SSDs, which use flash memory with no moving parts. This drive stores not only your personal files, but also your computer’s operating system, your apps and programs, and most hardware device drivers. When your hard drive fails and becomes unreadable, your computer will fail to start up. Based on the severity of the damage, you could be greeted by a black screen, or get stuck in an automatic repair loop as your computer tries (in vain) to repair itself. Here at Gillware, we’ve seen every variety of computer failure and just about every possible hard drive boot error message there is. At Gillware, our engineers divide data loss into two categories: physical and logical. Physical data loss happens when your computer’s internal hard drive breaks down. The spinning disk platters containing your data can wear out as they age, causing portions of the disks to become unreadable. A failure of any other component of the hard drive can also make some or all of the drive unreadable. This makes the data on your hard drive inaccessible. When hard disk drives fail, they can make unusual clicking, beeping, or grinding noises. You may not be able to hear these noises clearly until you remove the drive from your computer. When you hear your hard drive clicking or making other unusual noises, you must avoid powering it on. Running a hard drive while it clicks or beeps can worsen the damage it’s already sustained, risking permanent and irreversible data loss. Failed hard drives must be repaired by data recovery experts in a clean room data recovery lab. One of the more well-known Windows 10 startup errors, the 0xc00000e9 error code. Logical data loss happens due to deleting files, reformatting a hard drive, or reinstalling or restoring your computer’s operating system. These actions disrupt the logical file system that tells your computer where the data lives on it. Every file has a set of directions telling your computer where it lives. Deleting files or reformatting your hard drive erases the directions pointing to those files. When your computer erases those directions, it can start putting new data on top of the old data, overwriting it and potentially causing permanent data loss. Using your computer after deleting files causes new data to be written to your hard drive. The more you use your computer after deleting a file, the less likely the data can be recovered successfully. To recover deleted files from your hard drive, our engineers use advanced forensic imaging tools to copy and analyze your hard drive without altering any of the data on the drive itself. When your hard drive goes belly-up, only a professional computer data recovery service with a world-class clean room lab has the tools needed to repair it. At Gillware, we do whatever we must to salvage the data from your hard drive. These include temporary repairs to get the drive up and running again. Hard disk drives have many points of failure. A failed hard drive may need its magnetic read/write heads replaced (maybe even several times). It may need to have its printed circuit board replaced or its complex hard drive firmware fixed. The inside of a hard drive is filled with extremely sensitive equipment; even a tiny amount of dust can cause severe damage. 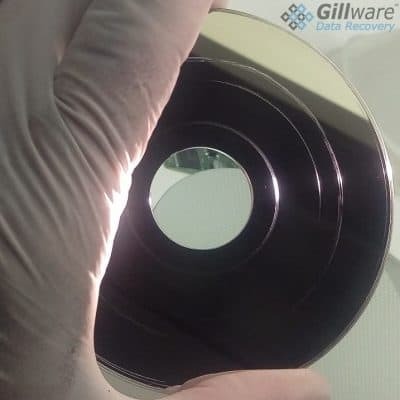 In Gillware’s clean room data recovery lab, our data recovery experts can make these hard drive repairs in a clean, contaminant-free environment. A failed hard drive’s data storage platters can become scratched when it breaks down. This can cause severe damage to the drive and cause irreversible data loss. The platters are coated with a thin magnetic layer that holds all of your data. Scratches in the platter scrape off some of this coating, physically destroying the data. What’s more, the dust from the scratches spread throughout the inside of the drive, embedding itself in the platters. To recover data from these damaged platters, our engineers use advanced platter burnishing tools to clean the dust off of scratched platters. Many of the latest models of laptop and notebook computers have solid state drives instead of hard disk drives. Solid state drives have no moving parts, unlike hard drives. They use flash memory chips instead of spinning disks to store data–like a giant USB flash drive, but much more complex. SSDs tend to be more expensive than traditional hard drives, but as the cost of producing them falls, more and more laptops and notebooks are beginning to use them to replace traditional hard drives. Because SSDs have no moving parts, they are much more resistant to physical failure. It may seem that they would be easier to repair as well. When SSDs do fail, though, they can be much more difficult to repair than hard disk drives, since the technology involved is so much more advanced. At Gillware, our engineers have pioneered incredible SSD data recovery methods. The computer data recovery service provided by Gillware is not only world class; we work hard to make our services affordable as well. Gillware’s affordable data recovery process makes us one of the most customer-friendly data recovery businesses in the industry. We start with a free data recovery evaluation. For customers in the continental United States, we even provide a free UPS shipping label to cover the cost of sending in your computer’s hard drive or SSD to our data recovery lab in Madison, Wisconsin. Once we’ve completed the evaluation, we give you an exact price quote for our data recovery services. You’re free to accept or decline the quote; if you decline, we charge no opt-out or cancellation fees. If you approve the quote, we go ahead with our data recovery work. We charge no upfront fees for data recovery work. In fact, not only do we not charge anything upfront, but we also only charge for our work after we’ve successfully recovered your data. If we cannot recover your important files, we charge you nothing for the attempt. In addition to being affordable, our computer data recovery service is also very secure. Our data recovery facilities and personnel all meet SOC-2 Type II security standards, so you can trust that when you send your failed computer storage device to us, your data will never fall into the wrong hands.